On Tuesday Helen Rennard, R and I climbed Ravens Edge on the Buachaille. 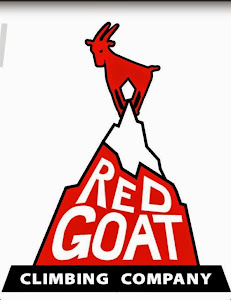 The route gets VII, 7 in both scottish winter climbs and the glen coe SMC guides but I think the VII, 8 which it is given on UKC is a better grade. 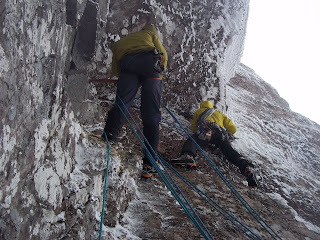 I picked R up on my way over and we met Helen in the Buachaille car park at 7am. Everything was looking pleasantly white and the clouds were just brushing the top of the mountain. 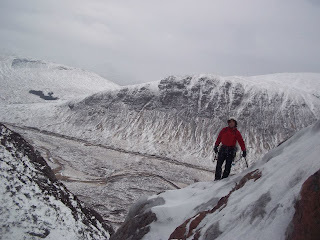 We set off up the footpath and geared up at the bottom of great gully. Great gully has a couple of interesting ice steps and the snow was quite well compacted. Ravens Edge makes its way up the buttress to the right of Slime Wall, with Ravens Gully splitting them. Ravens Edge look very nice and white high up and the turf on the approach to it was quite good in places. Ravens Gully seemed to be holding a fair amount of ice, which I've heard is rare for this route. Helen led the first pitch which is a long 55m pitch of quite run out ground, all be it never too hard. The second pitch was R's. It took a thin rising traverse line into a large open book corner. There was gear, although not that much, so it was important for neither second nor leader to fall off here. We all got up that fine and next it was my turn on the main corner. The start was barred by a small roof, which I traversed under. In the process I ripped a block off which I thought was a very good hook. I managed to stay on and kept on going. The rest of the pitch was quite sustained, but the gear was good if you could place it. There was one more scary moment when both my feet came off. 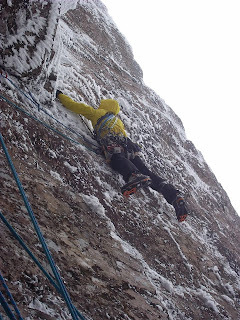 Luckily I was on good hooks and it actually allowed me to place my crampons on the higher holds I was trying to get to. 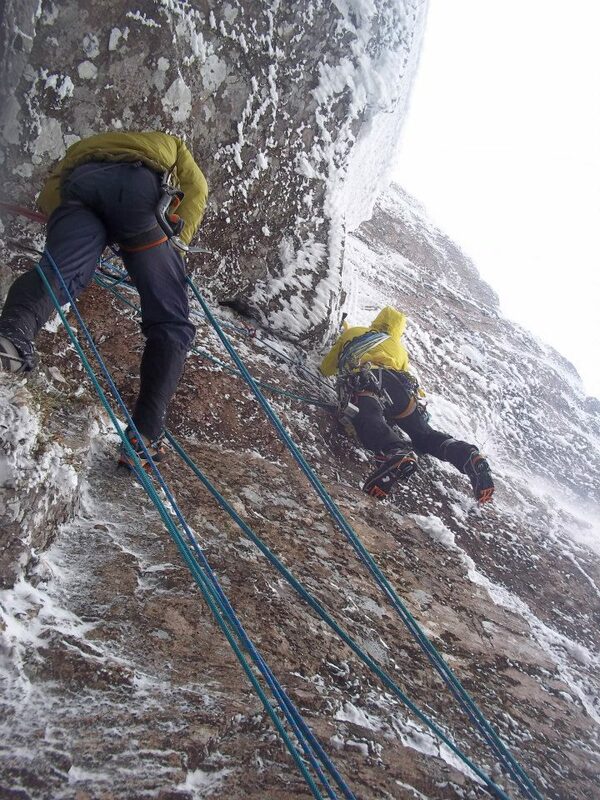 This pitch turned out to be by far the crux on the day. That pitch took a while so we decided it was best to try and run pitches 4 and 5 together. 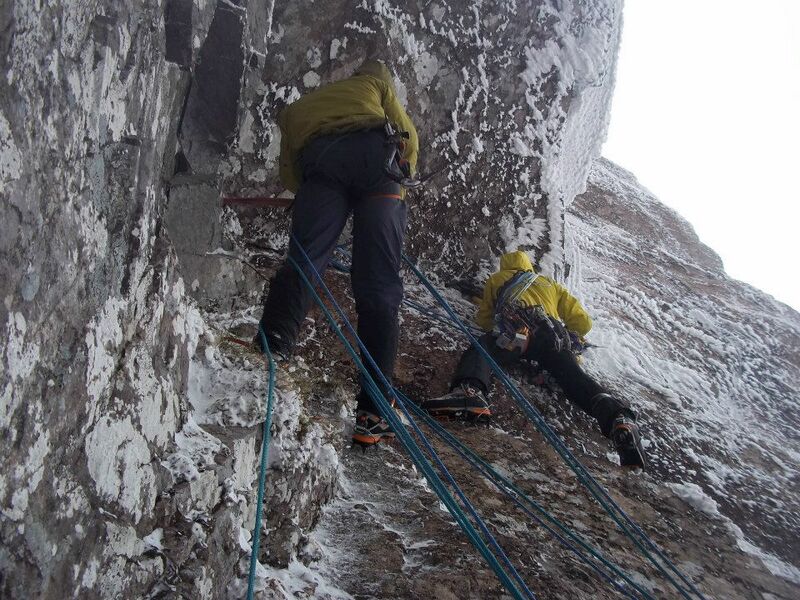 This should have been 65 meters of climbing, on 60 meter ropes, but we decided to have a go anyway. R climbed pitches 4 and 5 very quickly, and used just under 60 meters of rope. Pitch 6 was a short easy pitch to finish which I climbed. It was a bit longer than the 10 meters suggested by the guide, but was nice quite easy so we managed to top out just before dark. 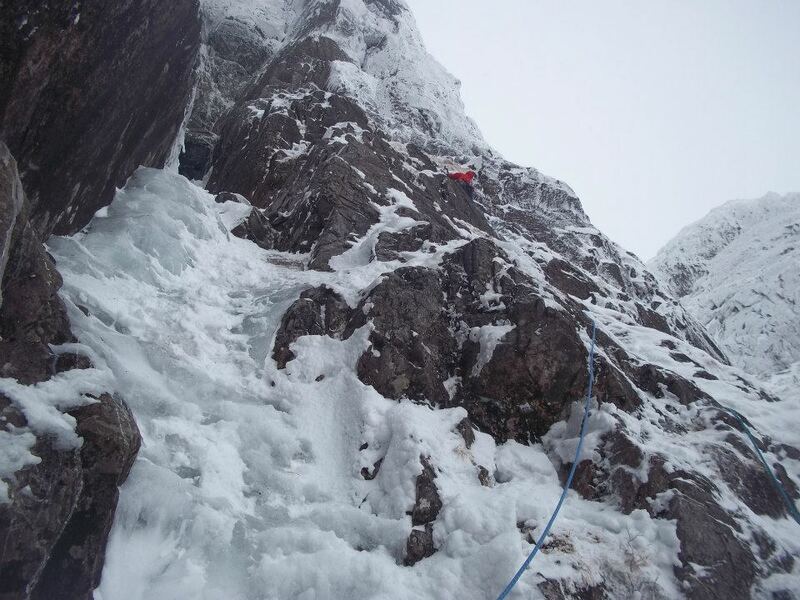 We descended down great gully, which needed 3 abseils to avoid the ice, and we were soon at the bottom. Im really pleased to have climbed Ravens Edge. According to UKC it hasn't been completed since 2008, which was by Ian Parnell and co., and has only been attempted once since. UKC isnt an exhaustive list of ascents so if anyone knows otherwise please tell me. Anyway to sum up conditions on the Buachaille low down things look in thanks to the low freezing levels and snow of recent. There would have been more pictures but no one else brought a camera and I forgot to charge mine, and I also couldn't see R on pitch 2 to take any of him. I will add some more photos later when Im on my own computer, this was a library job.